The LAST thing any of us want is a pimple while we're on amazing vacation, important business trip or - gasp a Honeymoon! I've found a new skincare secret that is about to take all your fears away. The Oxy On-The-Go Acne Stick is a brilliant idea. It's an on-the-go easy to pack or carry stick with powerful benzoyl peroxide based formula to fight pimples. The Oxy On-The-Go Acne Stick tube is the size of the average lip balm. It also has 5% benzoyl peroxide, which makes a real difference is getting those pesky occasional pimples to clear up - fast. While testing the Oxy On-The-Go Acne Stick recently I found that the clear stick, with a easy to use, no-touch applicator, reduced my breakouts significantly, especially if I was able to catch them as soon as the appeared. I applied about 3x day (I could apply it over makeup as well) and then once again after cleansing at night. In 1 day the pimple was almost completely gone. 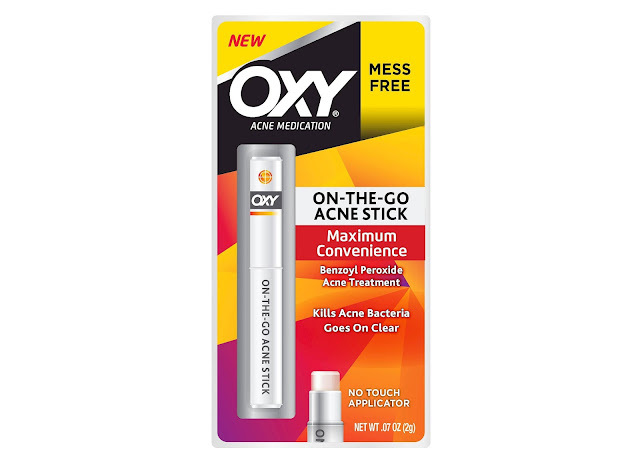 I was impressed the Oxy On-The-Go Acne Stick formula was completely clear and absorbed instantly. It didn't leave any cakey residue or white cast on my skin. I was able to layer any skin care products/sunscreen or makeup over it with no sliding off, pilling or flaking.